Washington, NJ: Vibrating dewatering screens from process equipment manufacturer The Witte Co., Washington, New Jersey (www.witte.com), remove excess moisture from saturated materials to allow fast, efficient drying downstream in a fluid bed dryer. Draining the moisture mechanically at low cost instead of using heat energy, the vibrating dewatering screens reduce the moisture content of coarse products in a slurry to 2-4% while continuously feeding the material to the dryer at up to 20,000 lbs./hour in a form that allows the remaining moisture to be more efficiently removed at a far lower cost than by drying alone. With 1,000 BTU’s of heat energy required to evaporate a single pound of water, the integrated dewatering and drying system offers significant cost savings in common applications. 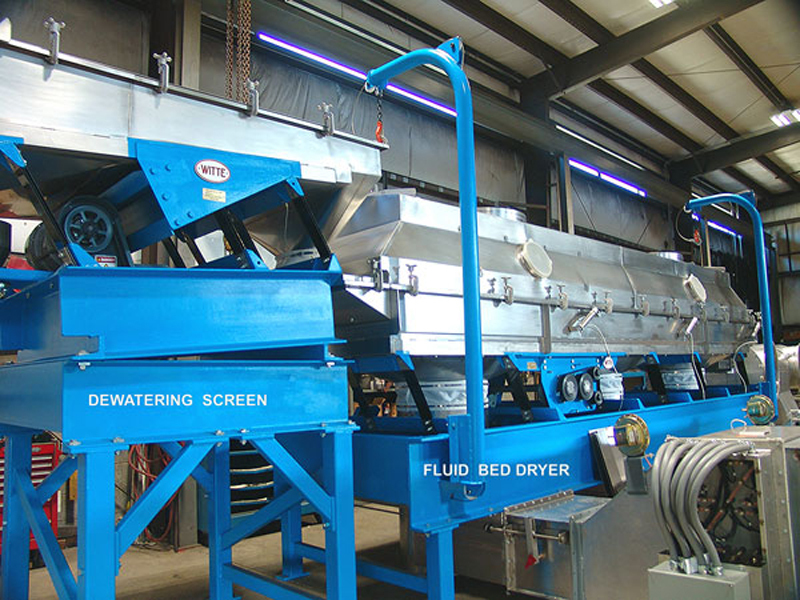 An effective alternative to filter presses and dewatering screws, the Witte vibrating dewatering screens are ideal for drying plastic pellets, ground meats, nuts and seeds, fruits and pulps, shredded and chopped recycled material and other viscous products where a very low moisture level is required at dryer discharge and cost is an important consideration. For added efficiency, the Witte dewaterer may be fitted with spray nozzles to integrate rinsing and/or flavoring steps into the process.